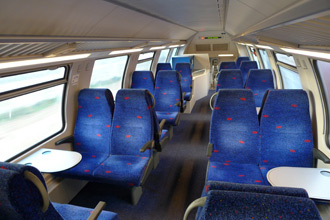 Train travel in Israel . 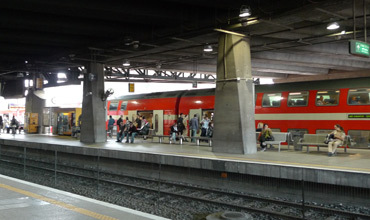 . .
Once in Israel, it's easy to get around on an efficient and inexpensive train network, between Ben Gurion Airport, central Tel Aviv, Jerusalem, Haifa, Akko and Be'er Sheva. Trains typically run every 30 minutes - or every hour or two to/from Jerusalem. Although reaching Israel by land or sea at the moment is tricky, with the war in Syria and a dearth of ferries in the Eastern Mediterranean. Useful country information - visas, currency, etc. GMT+2 (GMT+3 from 02:00 on the Friday before the last Sunday in March until the last Sunday in October. £1 = approx 4.7 shekels (NIS). $1 = 3.8 shekels. Currency converter. www.goisrael.com. Most of Israel is perfectly safe to visit, even for families with children - in spite of what you might see on the news. You should check the latest Foreign Office travel advice at www.fco.gov.uk. Citizens of the UK, EU, USA, Canada, Australia & New Zealand do not need a visa to visit Israel. See http://mfa.gov.il/MFA/ConsularServices/Pages/default.aspx to check. Israel has a modern and rapidly-expanding train network - the roads around Tel Aviv are often gridlocked at rush hours, so the train is a great transport solution. 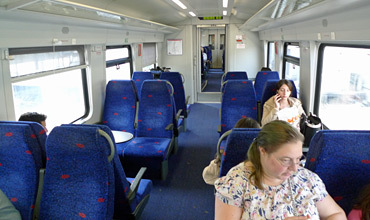 The trains are frequent and inexpensive, and come with toilets, power sockets and free WiFi. You can check train times at the Israeli Railways website, www.rail.co.il - click 'English' at the top. This also has a route map. The main line links Be'er Sheva, Tel Aviv, Haifa, Akko & Nahariya, with fast trains every 30 minutes. Trains link Tel Aviv to Jerusalem every hour taking 90 minutes or so over the slow, twisting and scenic line originally built in Ottoman times, see the Tel Aviv to Jerusalem page (you now need to switch trains at Bet Shemesh). New fast Tel Aviv to Jerusalem trains started in 2018: See the Tel Aviv - Jerusalem section below. Expect to go through a quick and simple security check - often with baggage X-ray & metal detector portal - at the entrance to each station. You'll then usually need to go through automatic ticket gates to access the platforms, with an extra-wide one if you have luggage. Tel Aviv doesn't have one main central station, but 4 stations spaced out through the city on a north-south rail line built through Tel Aviv in the 1950s between the carriageways of the Ayalon Highway. Most trains call at all four Tel Aviv stations, so just pick whichever is nearer to your hotel. 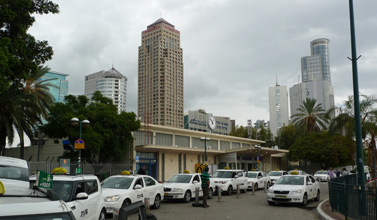 Tel Aviv Savidor-Center (pictured below) & Tel Aviv HaShalom (pictured here) are arguably the most important stations, both with plenty of taxis waiting outside Tel Aviv HaHagana is smaller, but it's the closest to old Jaffa, and as the southernmost one it's where you'd change trains when travelling between Ben Gurion Airport and Jerusalem. 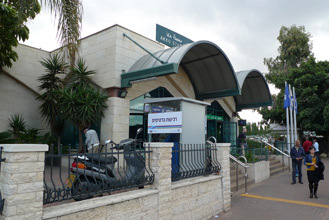 Tel Aviv Savidor-Center station. There's a baggage check at the entrance to stations with X-ray machine & metal detector. Just turn up, buy a ticket and hop on the next train - there is no need to reserve. It's possible to reserve seats on certain trains on which one carriage has been designated as 'all seats reserved' but I'd recommend not worrying about seat reservations, just buy a ticket, hop on and sit in any empty seat. Seat reservations aren't possible at all on the trains to or from Jerusalem, you just sit where you like. You can buy tickets at the station from the staffed ticket office or from the self-service machines which have a touch screen and English language facility. 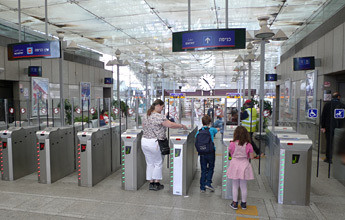 Both ticket office and machines accept credit cards, using the magnetic strip. 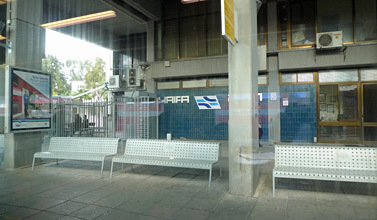 Fares are cheap: Tel Aviv to Jerusalem costs 23.50 NIS, about £4 or $6. Tel Aviv to Haifa costs 32 NIS, about £5.50 or $8. 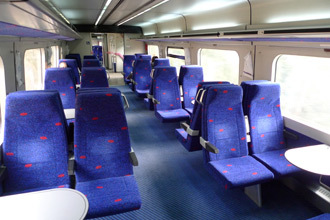 You can check fares at www.rail.co.il. Infants under 5 go free, but there is no discount for children when buying regular point to point tickets unless you get hold of the 'Rav Kav' smartcard. 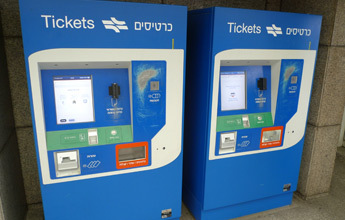 The Rav Kav card card is free, but can only be applied for at certain stations, including Tel Aviv HaShalom and Tel Aviv Savidor. Using a Rav Kav card there is a 20% discount if you buy a round trip ticket rather than two one-ways. On Mondays-Thursdays & Sundays, 2 trains an hour link Tel Aviv (all 4 stations) with Haifa, Akko (Acre) & Nahariya. The Tel Aviv to Haifa journey takes 50-60 minutes for the 85km (53 miles). 3 trains an hour link Tel Aviv with Be’er Sheva, some trains starting back in Haifa. 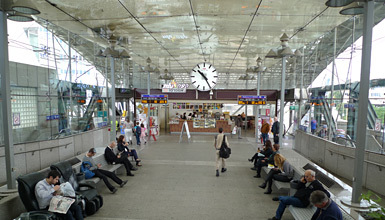 On Fridays, trains run hourly in each direction on both routes until around 13:00, there is no service on Friday afternoons, or on Saturdays until after dark. You can check train times at www.rail.co.il. 1) Using the historic Jaffa-Jerusalem railway from Tel Aviv HaShalom or Tel Aviv HaHagana stations through the scenic judean Hills to Jerusalem Malha station located in the SW suburbs of Jerusalem, see the Tel Aviv to Jerusalem page. Worth doing in one direction for the experience and historical interest. 2) Using the new fast link which opened on 25 September 2018 and which when fully complete will cut journey time to just 28 minutes. This new fast line links Tel Aviv to a new station called Jerusalem Yitzhak Navon opposite Jerusalem's central bus station, just to the west of the old city and within easy walking distance of all the sights. Initially, trains will link Ben Gurion Airport & Jerusalem Yitzhak Navon every 30 minutes, journey time 20 minutes. If you want to go to or from Tel Aviv HaShalom or Tel Aviv HaHagana stations in Tel Aviv city centre you must change trains at Ben Gurion airport. Total journey time from Tel Aviv HaShalom to Jerusalem Yitzhak Navon is just 51 minutes. Fare 22 shekels. Buy at the station. Check times & prices at www.rail.co.il. 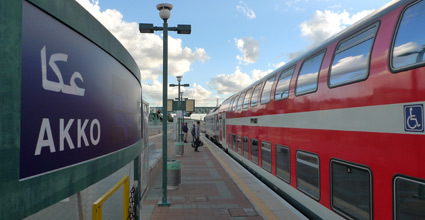 Trains link Ben Gurion Airport with Tel Aviv & Haifa every 30 minutes, journey time to Tel Aviv Savidor-Center 18 minutes, daily except Friday nights & Saturdays. To reach Jerusalem, change at Tel Aviv HaHagana for Jerusalem Malha - at Tel Aviv HaHagana there's a cafe on the overbridge inside the ticket gates for a coffee & cake between trains. You can check train times at www.rail.co.il. When you arrive by air at the airport, follow the signs to 'trains'. The station is on the ground floor right outside the exit from terminal 3 arrivals. 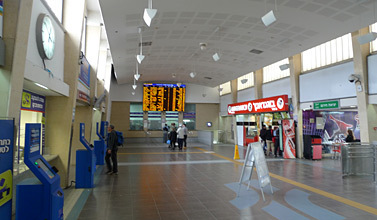 Look for any train on the departure boards shown as going to Nahariya, as these go to all four Tel Aviv stations. When heading back from Tel Aviv to Ben Gurion airport, look for a train going to Modi'in Center as these all call at Ben Gurion Airport. When you walk out of the ground floor exit from terminal 3 signed 'Trains', this is the entrance to Ben Gurion Airport Station. You can buy from the ticket machines in English, or use the staffed ticket office located on the other side of that wall. 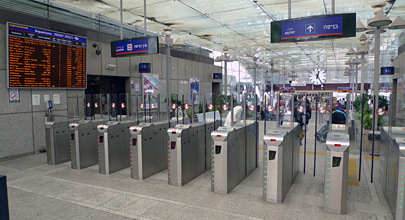 There are automatic ticket gates just visible in this photo, then lifts & escalators down to the platforms. 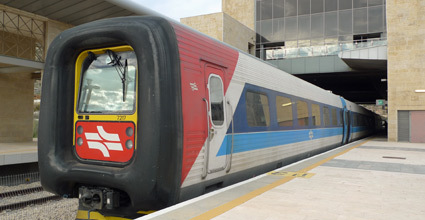 There are essentially just 3 types of train in Israel: The red double-deck and blue single-deck used on most lines, and the Danish-designed IC3 trains used on the line from Tel Aviv to Jerusalem. 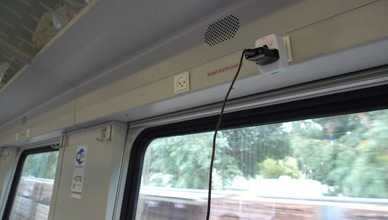 All these trains have toilets, power sockets & free WiFi. 1. The red double-deck trains... Each train has a diesel locomotive at one end. 2. The blue single-deck trains... Each train also with a diesel locomotive at one end. 3. 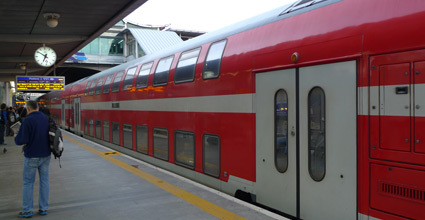 The Danish-designed IC3 trains on the classic route to Jerusalem... These trains have diesel-electric power under the floor. 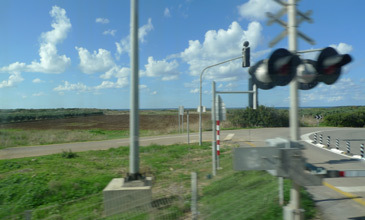 They operate the Tel Aviv to Jerusalem line as they are the only type which can cope with the tight curves on this once-narrow-gauge line dating from 1892. As from 2017 you need to switch trains at Bet Shemesh when travelling between Tel Aviv & Jerusalem. 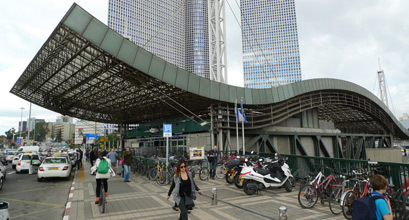 Tel Aviv HaShalom station - through the quick security scan at the entrance. 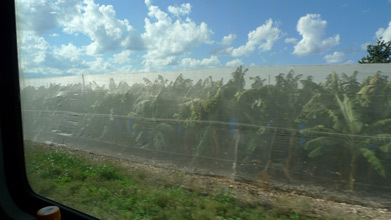 ...And even the occasional banana plantation. ...Before running along the Mediterranean coast. Haifa Bat Galim. Note the exit turnstile. Option 1: Travel by train all the way via Syria & Jordan. Before the war in Syria, this used to work OK in the outward (London to Israel) direction, and could only be used in the return (Israel to London) direction if you were careful to avoid any indication in your passport (or anywhere else) of your visit to Israel. This was because you couldn't enter Syria with any evidence of a visit to Israel in your passport. The route was London - Paris - Vienna - Budapest - Istanbul - Aleppo - Damascus - Amman - Allenby Bridge - Jerusalem. Now, of course, the war in Syria blocks this route. Option 2: Travel by train+ferry to Athens, then by ferry from Piraeus to Israel. The catch here is that Poseidon Lines & Salamis Lines direct ferries from Piraeus to Cyprus & Israel stopped running in 2001 because of the political situation in Israel, and still show no signs of resuming. You can check the with UK ferry booking agents www.viamare.com if you like. 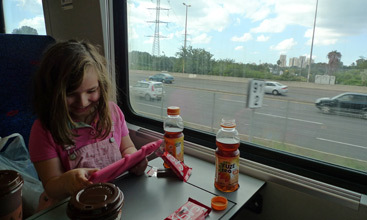 Option 3: Travel by train+ferry UK to Athens, then by cruise ferry via Cyprus. A new Rhodes-Cyprus & Cyprus-Israel cruise service started in summer 2008 running June-October, and would take one-way passengers at least if you booked near to departure date. But it's had its ups and downs and I don't believe it's currently running, see www.varianostravel.com/Cruises/ferry_service. 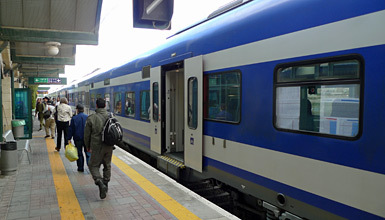 See the London to Greece page for train travel between London and Athens. Option 4, Grimaldi freighter cruises... This option may still work! One option which may still work is to contact www.grimaldi-freightercruises.com. 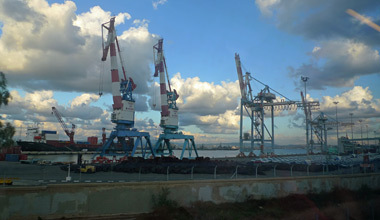 They run weekly freighters from various European ports including Southampton (UK), Salerno (Italy) & Piraeus (Greece) to Haifa & Ashdod in Israel which carry a limited number of passengers. Feedback would be appreciated! 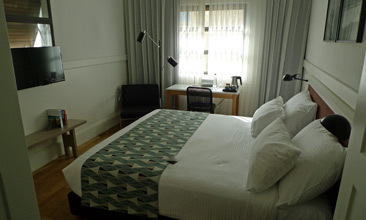 The Lily & Bloom Hotel occupies a 1930s Bauhaus-style building which was originally a bank. Located just off Allenby, near the junction with Rothschild Boulevard, the Lily & Bloom hotel has friendly staff, great clean rooms and does an excellent breakfast - and of course there's free WiFi. 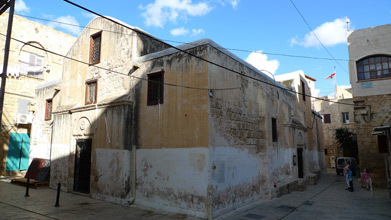 It's a short taxi ride from HaShalom station, and 15-20 minutes walk from Old Jaffa. 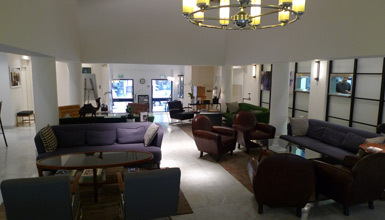 If you'd prefer to stay in the old city of Jaffa rather than busier, more modern Tel Aviv, try the highly-rated Margosa Hotel, Jaffa. 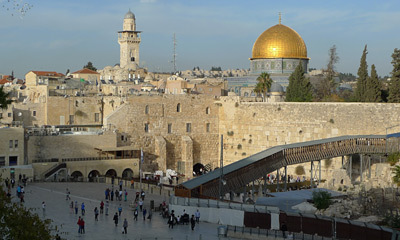 If your budget will stretch, the most famous hotel in Jerusalem is the King David Hotel. Opened in 1931, the building was used as the British administration HQ during the British Mandate period 1917-1948 - the south west wing was blown up in 1946 by zionist activists. 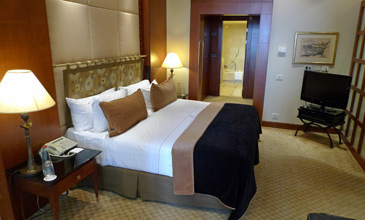 Today, it's an excellent luxury hotel with great character, 15 minutes walk from the the Jaffa Gate into the Old City. The rooms at the rear of the hotel have views over the city wall. More about this hotel at https://en.wikipedia.org/wiki/King_David_Hotel. Also at the upper end of the scale, the American Colony Hotel gets great reviews. 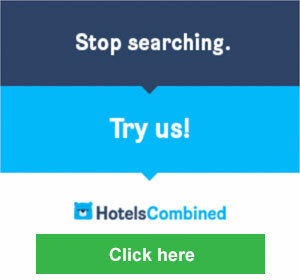 For cheaper options, just check Booking.com. 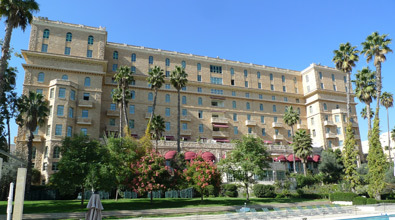 The famous King David Hotel, Jerusalem. 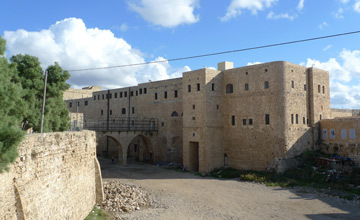 Below, the view of the old city from rooms at the rear of the hotel.